When we think of wild animals losing their habitats, we usually envision elephants, rhinos, and tigers in faraway places. But monarch butterflies are losing their homes right here in the US—and our food is playing a part. Migrating monarch butterfly populations are continuing to decline. In Mexican forests, monarchs inhabited only 6.12 acres in December 2017, a 15% decline over the last year and an 86% drop since 1996, according to the latest survey from the WWF-Telmex Telcel Alliance, in coordination with Mexico’s National Commission for Protected Areas. Because it is impossible to count butterflies accurately, WWF and its partners track their populations by measuring the area they occupy when wintering in Mexico. Many factors have contributed to the decline in monarchs, including climate change, the deforestation of habitat in Mexico, and the loss of native plants in the US that monarchs rely on to feed and reproduce. The historic 2017 hurricane season also took a deadly toll on monarch butterflies, according to researchers. Every fall, several generations of monarchs migrate thousands of miles from the northern US and southeast Canada to their overwintering grounds in Mexico. How many butterflies arrive depends on how many can survive and reproduce during their migration. The butterflies’ migratory path runs right through America’s Great Plains. The journey is so long, it takes several generations to complete. Along the way, monarchs rely on milkweed, which is the only plant on which they lay their eggs and the only source of food for baby caterpillars. Unfortunately, milkweed and other native plants are disappearing, reducing the food that pollinators like the monarch need. Urban and suburban expansion is responsible for some of this loss, as is shifting agriculture. In recent years, the Great Plains lost intact grasslands faster than the Brazilian Amazon lost rainforest. About 2.5 million acres were lost to crop production across the Great Plains in 2016, largely driven by shifting production of crops such wheat, soy, corn, and canola, according to WWF’s 2017 Plowprint Report. So what is WWF doing? WWF continues to work with the Mexican government, local communities, and partners to protect the monarch hibernation grounds in the Monarch Butterfly Biosphere Reserve, and to support sustainable projects that provide economic alternatives to the people who live in the monarch region. In the US, we’re also taking a variety of measures to help save the monarch butterfly migration. First, WWF is working with many leading US food companies and other environmental organizations to help farmers increase biodiversity on their lands and reduce the impact that crop production has on our environment. We’re also advocating for policies that help ranchers and farmers maintain healthy grasslands and implement conservation practices on working lands. By using cropland more efficiently, farmers can yield more crops per acre and limit the need for further expansion. And by planting more diverse vegetation between fields and alongside streams and gullies, farmers can also support pollinators while helping the land absorb heat-trapping greenhouse gases, store water, and keep soil, fertilizers, and other compounds from polluting nearby waterways. You can join farmers, ranchers, policymakers, and conservationists to help. 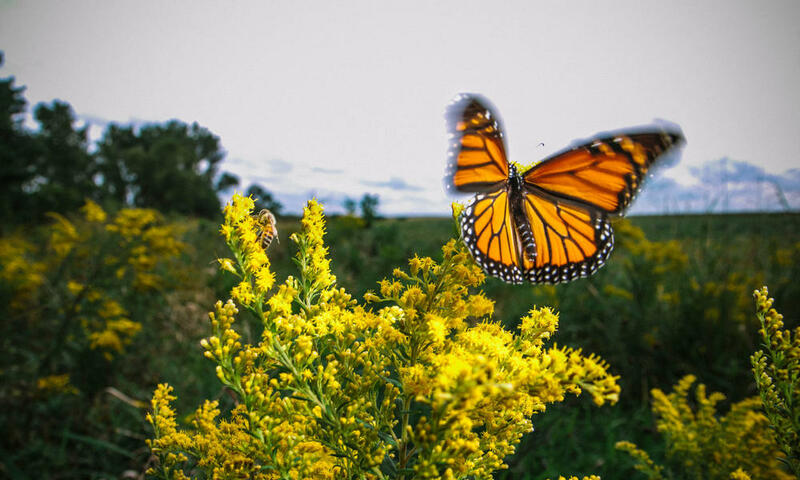 We are asking everyone to join the Monarch Squad to get the latest news about these butterflies and to help the miraculous migrating monarchs by planting milkweed in their backyard.